"Fronting the justices' bench, and on each side of it, are several long steps or stairs.... This Court House is capable to contain above 800 persons without incommoding each other. 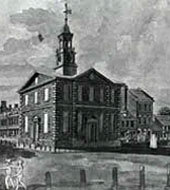 The Court House was destroyed by fire in June 1784. A new Court House was subsequently erected on the same site and was completed in 1787.